The relationship between weight and risk may not be what many believe. Study suggests obesity should be considered a risk factor. For years, it was believed that obese women had a lower risk of developing osteoporosis and that excess body fat actually protected against bone loss. However, a study presented at RSNA 2010 contradicts that belief and suggests having too much internal abdominal fat may have a damaging effect on bone health. According to the Centers for Disease Control and Prevention, approximately 72 million American adults are considered obese, defined as having a body mass index (BMI) of 30 or more. Obesity is associated with many health problems, including cardiovascular diseases, diabetes, high cholesterol, asthma, sleep apnea, and joint diseases. Yet despite all the health issues, it was commonly accepted that women with increased body weight were at lower risk of bone loss. According to the National Women’s Health Information Center, 10 million Americans have osteoporosis and 18 million more have low bone mass, placing them at risk for the disease. But not all body fat is the same. Subcutaneous fat lies just below the skin, and visceral or intra-abdominal fat is located deep under the muscle tissue in the abdominal cavity. Genetics, diet, and exercise all contribute to the level of visceral fat stored in the body. Excess visceral fat is considered particularly dangerous because in previous studies it was associated with an increased risk of heart disease. Bredella and colleagues set out to evaluate the abdominal subcutaneous, visceral, and total fat as well as bone marrow fat and bone mineral density in 50 premenopausal women with a mean BMI of 30. Each woman underwent an MR spectroscopy exam to evaluate the bone marrow fat of the L4, the fourth vertebra in the lumbar section of the spine. Then the bone mineral density of the L4 was assessed using quantitative CT, which measures bone mass and is used to assess bone loss. The imaging revealed that women with more visceral fat had increased levels of bone marrow fat and decreased bone mineral density. However, there was no significant correlation between either subcutaneous fat or total fat and bone marrow fat or bone mineral density. A new ultrasound technique is proving valuable in distinguishing malignant from benign breast lesions in some patients, which could mean fewer unnecessary breast biopsies, a new study shows. Ultrasound elastography’s ability to image tissue softness and firmness can help predict cancer in patients with Breast Imaging Reporting and Data Systems (BI-RADS) category 4 masses, according to a study published in the January issue of the American Journal of Roentgenology. “Because malignant tumors predominantly are harder than benign tissues, this technique significantly improves the differentiation between benign and malignant tissue” says Hiroko Satake, MD, lead author of the study performed at Nagoya University School of Medicine in Japan. “In an analysis of 115 breast masses that were recommended for biopsy—they were categorized as either BI-RADS 4 or BI-RADS 5—ultrasound elastography was 79% accurate in identifying cancer. “By accurately identifying benign tumors with imaging, we may be able to avoid sending patients for unnecessary biopsies,” Satake continues. Ultrasound elastography provides radiologists with elasticity scores, with lower scores meaning that the mass contains softer tissue. “Based on the results of our study, we recommend that patients with BI-RADS 4 masses should undergo biopsy if their ultrasound elasticity score is 4 or 5,” Satake says. He adds that ultrasound elastography should be used as an adjunct to standard sonography and dynamic contrast-enhanced MRI, which are currently being used to classify breast lesions based on the standard BI-RADS categorizations. MRI screening for breast cancer delivered consistent rates of cancer detection and fewer false-positive results when prior exams were available for comparison, according to a study published online in Radiology. While MRI can be more effective than mammography for identifying suspicious areas of the breast, it cannot always distinguish between cancerous and benign lesions, which can result in additional testing and false-positive results that may cause anxiety for patients. A screening exam is considered to be false-positive when its results recommend further testing or a biopsy of a suspicious finding but no cancer is found. In the baseline group, MRI identified two cancers, for a cancer detection rate of 0.65%. In the repeat screening group, the cancer detection rate was nearly twice as high: Cancer was found in four patients, for a rate of 1.17%. While the cancer detection rate was higher in the repeat screening group, women undergoing an initial exam were nearly four times more likely to be recommended for a follow-up MRI exam in six months to monitor suspicious findings (31 of 307 women, or 10.1%) than patients who had one or more prior MRI exams for comparison (nine of 343 women, or 2.6%). The rate of false-positive results was 13% (39 of 299 patients) in the baseline exam group and 5.6% (19 of 341 patients) in the annual exam group. Researchers in Washington state investigated the use of breast MRI to identify additional occult cancer in women already diagnosed with breast cancer. They found preoperative breast MRI detects otherwise occult cancer with a relatively high degree of accuracy when applied to a diverse population of patients newly diagnosed with the disease, according to a study in the January issue of the American Journal of Roentgenology. “Our data add to the growing body of literature that documents breast MRI’s ability to detect otherwise occult additional disease in patients who have been newly diagnosed with breast cancer,” says Robert Gutierrez, MD, lead author of the study that was performed at the University of Washington and Seattle Cancer Care Alliance. Gutierrez and colleagues’ review started with 592 patients who were recently diagnosed with breast cancer and underwent staging with preoperative breast MRI. The analysis included 570 patients whose biopsy rates, positive predictive values of biopsy, and overall cancer yields were calculated and compared. “We found that use of preoperative breast MRI in newly diagnosed cancer patients resulted in an added cancer yield of 12%. This is much higher than the added cancer yield of 0.08% to 6.7% seen with high-risk screening breast MRI, a more widely accepted indication for breast MRI,” Gutierrez says. You’ve likely heard people say that not knowing whether you are sick is worse than knowing what’s wrong with you. 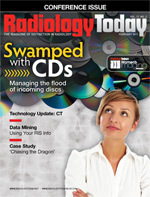 Research presented at RSNA 2010 suggests that may be true. That uneasy feeling patients have while waiting for test results can be more stressful than knowing they have a serious illness. Lang and her colleague Nicole Flory, PhD, studied the stress levels of 214 women scheduled to undergo different diagnostic and treatment procedures. Immediately prior to the procedures, each woman completed four standardized tests measuring stress and anxiety levels. Of the 214 women, 112 were awaiting breast biopsy to investigate a suspicious lump in the breast; 42 were awaiting hepatic chemoembolization for liver cancer; and 60 were awaiting uterine fibroid embolization. Breast biopsy patients reported significantly higher levels of anxiety in one of the four anxiety measures than chemoembolization patients, and fibroid embolization patients. Three of the anxiety measures were rated as higher among breast biopsy patients than the other patient groups, but those differences were not statistically significant. Lang believes simple steps can be taken to alleviate patient stress prior to a procedure. “Training the medical team in how to talk to patients makes a huge difference. This can diffuse tension right away and can help patients to shape expectations in a more helpful fashion,” she said. Breast cancer patients who have a strong social support system in the first year after diagnosis are less likely to die or have a cancer recurrence, according to new results from research performed by the Vanderbilt-Ingram Cancer Center and the Shanghai Institute of Preventive Medicine and recently published in the Journal of Clinical Oncology. From 2002 to 2004, a total of 2,230 breast cancer survivors completed a quality of life survey six months after diagnosis, and a majority responded to a follow-up survey 36 months after diagnosis. Patients in the study were enrolled in the Shanghai Breast Cancer Survivor Study, a large, population-based review of female breast cancer survivors in China, which Vanderbilt University Medical Center and the Shanghai Institute of Preventive Medicine have carried out since 2002. The women were asked about physical issues such as sleeping, eating and pain, psychological well-being, social support, and material well-being. The answers were converted to an overall quality of life score. Six months after diagnosis, only greater social well-being was significantly associated with a decreased risk of dying or having a cancer recurrence. Compared with women with the lowest scores, women who scored highest on the social well-being quality of life scale had a 48% reduction in their risk of cancer recurrence and a 38% reduction in the risk of death. Emotional support was the strongest predictor of cancer recurrence. Specifically, women reporting the highest satisfaction with marriage and family had a 43% risk reduction, while those with strong social support had a 40% risk reduction and those with favorable interpersonal relationships had a 35% risk reduction. While a strong social support network influenced cancer recurrence and mortality during the first year, the association tapered off and was no longer statistically significant by the third year after diagnosis. This may be related to a smaller sample size of patients who answered the questionnaire or other factors beyond quality of life that take precedence in later years.